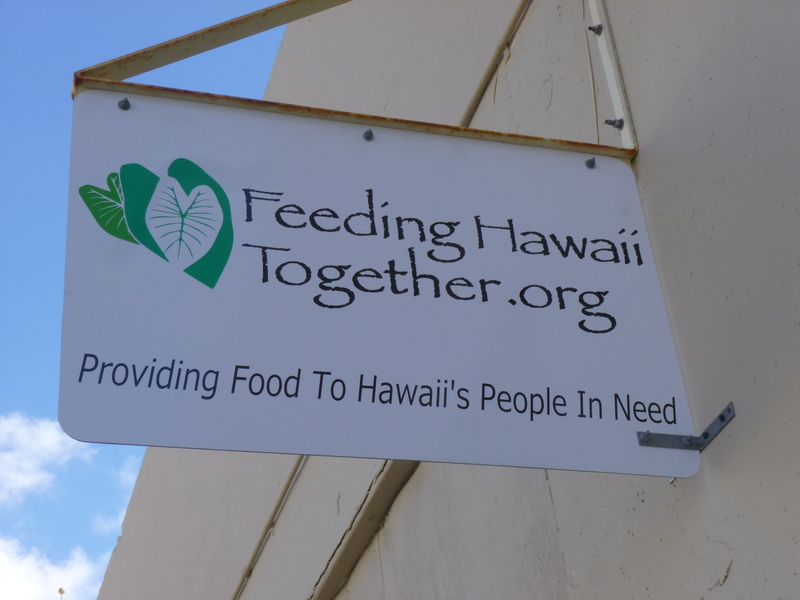 I wanted to do a food pantry type donation today since I haven’t done one in Hawaii yet, and there are quite a few food pantries in Honolulu and its environs. My challenge was to find one that was open today within walking distance or reasonable bus distance. So I spent a little time on the computer trying to narrow the search down, and then the front desk people were helpful as far as streets and locations, and The Giving Tree (one if the first places that caught my eye because I liked the name!) ended up being only about 2 miles away, and they were open on Thursday mornings. The front desk people printed out directions from Mapquest and I was on my way, after checking out of my room and storing my bags. Fortunately I have become somewhat familiar with the streets around my hotel, but I still find them confusing with all the vowels and Ls and Ks! I found the Giving Tree, and they had recently changed their name to Feeding Hawaii Together. This was a busy place! The waiting area is outside – its part of the building and under a roof, but no need for walls in that part with the balmy temperatures, and there were people of many nationalities waiting. I found one of the volunteers, Adam, and told him I’d be happy to make a donation if they needed it. And yes, they would like that! It was just going to be a financial donation because without a car (and there were no grocery stores nearby) it wasn’t feasible to shop for a food donation. Adam told me a bit about their program, and then he introduced me to Carl, who showed me all around and told me how they run their program, and wanted to hear any thoughts I might have since I’ve seen so many food pantries on the mainland. Carl has also written a software program to track the volumes of food coming in and out, and it sounds like other states are interested in the software. 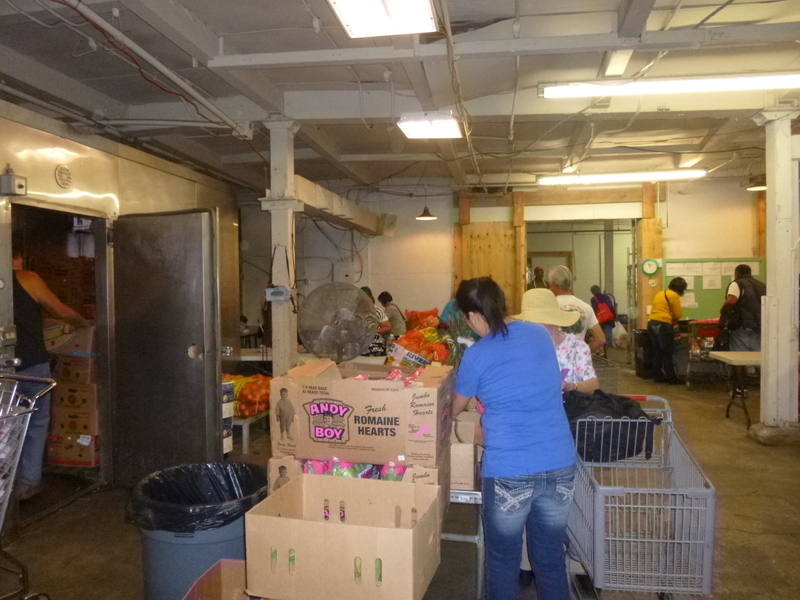 This food pantry is actually one of the bigger ones I’ve seen, and they do not limit the numbers of visits per year – people can come once a week for years if they need to-and many have. The volunteers seem to know many if them by name. 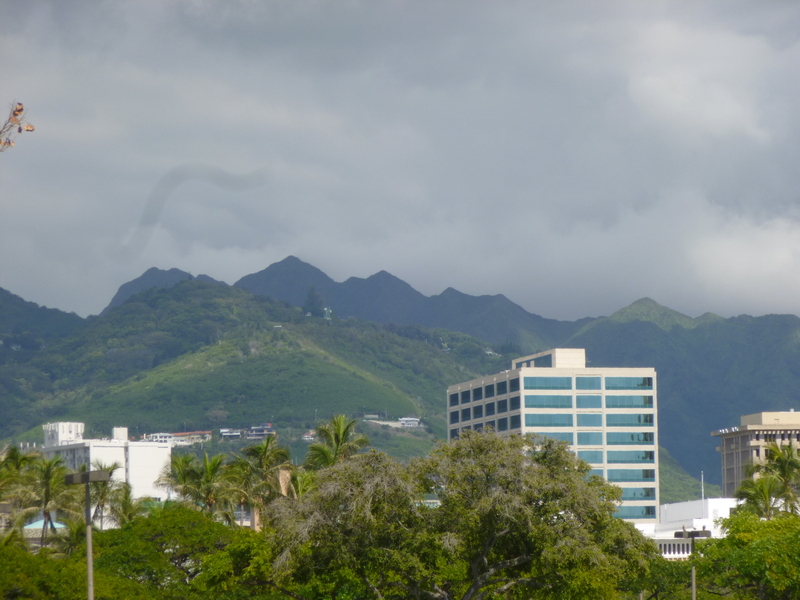 When I asked about people trying to become more self-sufficient and maybe find work instead of depending on the food pantry, he said for some people there is a genuine barrier as far as language and customs – Honolulu is such a melting pot of so many cultures that some people do have difficulties. I know if I was suddenly dumped in China and told to go find work in a Chinese business so I could buy food, I’d end up at a food pantry, totally overwhelmed! The people sign in when they arrive and get a number, and then have to wait their turn to shop. Some if them are impatient! When it’s their turn, they get a shopping cart, and wheel it thru the fresh produce area, then the canned goods area, the refrigerator/freezer area, and then I think there’s a place for bread. There are volunteers in each area to help with selections based on the size of the family, so that it doesn’t become a free-for-all. It’s very orderly. 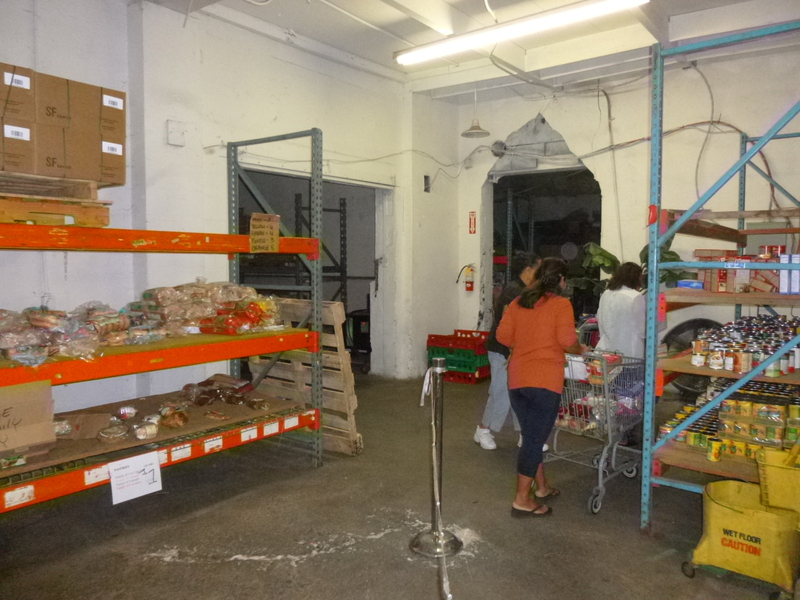 The clients have to bring their own bags and boxes – this food pantry is trying to go green as much as it can. They also have a thrift shop next door where the clients can choose out some clothes if necessary. I told Adam about some of the thrift stores I’ve seen that are open to the general public, and have low prices, and the sales also help support the food pantry. I enjoyed talking with them, and seeing their food pantry. 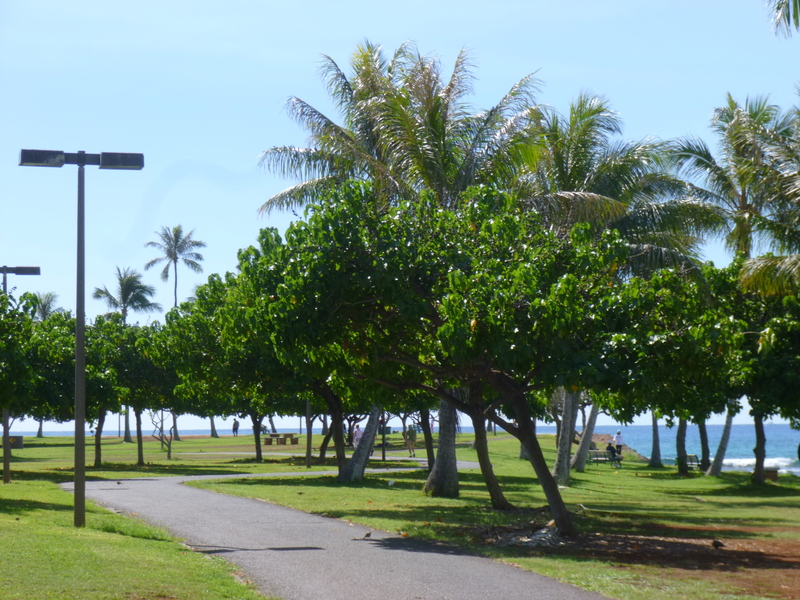 I headed back to the hotel out along the ocean instead of the back way, and came upon a huge park, where I was able to walk for miles on walkways by the sea, and beaches. There were lots of trees, and it was just do beautiful – just the sort of place I’d been imagining in Hawaii! I think this beach area is bigger and prettier than Waikiki, especially without all the commercial stuff and all the hotels. It wasn’t crowded at all – just acres and acres of green grass and trees, and paths and sandy beaches and blue sea and skies! I walked nearly 4 more miles all around the area before heading back to the hotel to get the taxi to the airport. I had a voucher from American Air for my taxi back to the airport, and I was going to get there very early to not miss the Samoa plane! My driver was Vietnamese, and we started out fine. Then we ran into some major construction and he got a little dramatic about that, and the possible delay. That made me a little nervous. We waited in traffic for a while, then he veered off in a different way, and we ran into a bit more traffic, and about the time I became more concerned, I could see the airport. Whew! I got checked in and all went well. 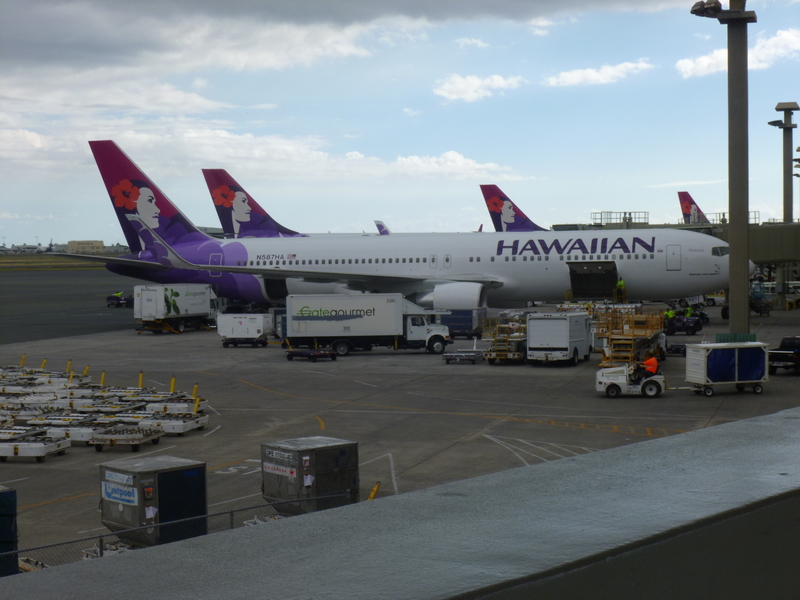 I had to wait a bit – some of the waiting gates for Hawaiian Air are sort of open-air – like buildings with ceiling and halls, but they’re big enough that they don’t always need walls, so you can feel the nice breezes. It’s just kind of different from the airports back on the mainland! The flight to American Samoa left on time, and Hawaiian Air was very nice. The seats were comfortable, and they served us dinner – chicken and rice in a sauce I couldn’t identify, and brought water by several times. It was kind of chilly on the plane, but they supplied blankets and pillows too. It was about a 5 1/2 hour flight – mostly south over the equator, and a little west. American Samoa is the only US territory south of the equator. They’re 6 hours behind east coast time. When we got off the plane about 9:00 at night, we were immediately hit by the heat and humidity. Wow! And it was raining a bit. We had to go through customs and immigration, and the motel I was staying at said they would send a shuttle – all I had to do was watch for a white van with the name on it. Lots of Samoan families were at the airport picking people up – whole families would arrive and there were lots of loud, happy, joyful greetings. I saw right away that a lot of people were driving pickups, and with the rain letting up a bit, lots of people were just climbing right into the backs of the trucks to ride. And I saw that all week. Some people even put lawn chairs in the backs of their pickups, and it’s not unusual to see them full of half a dozen people. As I learned later though, the speed limit is never higher than 25 mph – the roads are not in great shape and have lots of potholes, and they’re also quite curvy. So it’s not really possible to go much faster anyway. I never saw my van and the place was clearing out, and I was able to call the motel. She said the driver had been there, and he was nearby and she would ask him to come back, which he did. Apparently he had sent someone into the airport with a sign and had parked in a different place. But I got to where I needed to go. I had absolutely no sense of where my motel was in relation to the island, and couldn’t see anything in the dark on the way there, except a lot of stray dogs. It started raining again, and it was really strange not seeing or knowing much about my environment and where I had ended up. Boy, did that change in a week! 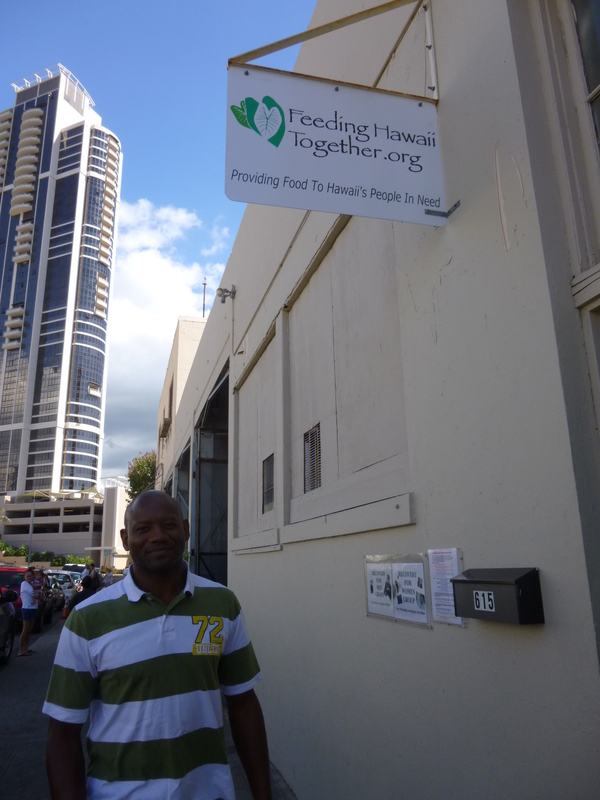 Hello Nancy – I want to express great thanks to you because of your visit to Feeding Hawaii Together here in Hawaii. I am so excited about your expedition you have endeavored on. This is fantastic & I pray traveling mercies to you for your trip. You could write a book! 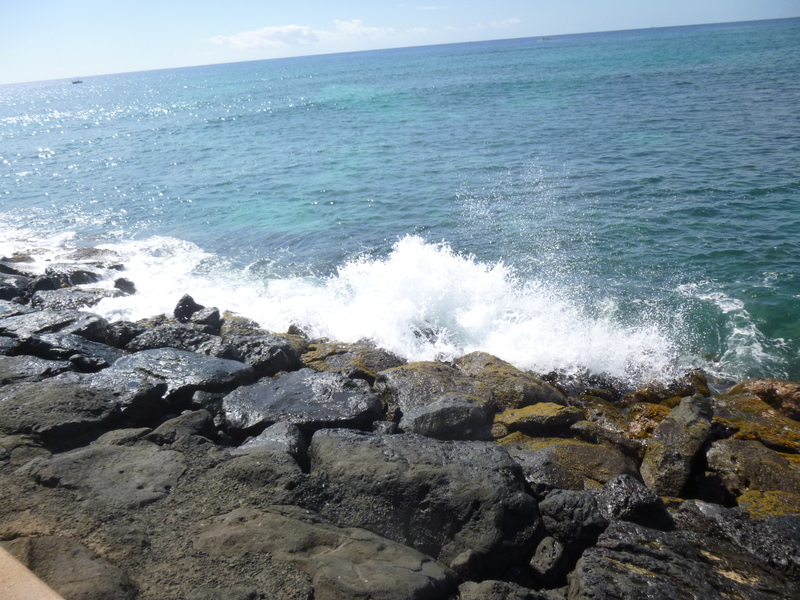 I am glad your trip here on Oahu was rewarding. Thank you so much again!